Map of Japanese provinces (1868) with Kawachi Province highlighted. Kawachi Province (河内国, Kawachi no kuni) was a old province of Japan in the area of Osaka Prefecture on the island of Honshū. 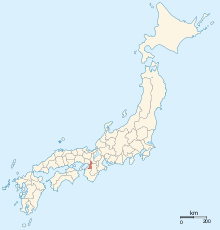 Kawachi province was established in the 7th century. In the 8th century, Izumi was separated from the older province during the reign of Empress Genshō. In the Meiji period, the provinces of Japan were converted into prefectures. Maps of Japan and Kawachi Province were reformed in the 1870s. Hiraoka jinja was the chief Shinto shrine (ichinomiya) of Kawachi. The shrine is located in Higashiōsaka. ↑ Nussbaum, Louis-Frédéric. (2002). "Kawachi" in Japan Encyclopedia, p. 496.